There are two reasons the nutrient profiling system known as NuVal®, which assigned a score from 1 to 100, the higher the number the more nutritious the food, has disappeared from the shelves of the nearly 2,000 U.S. supermarkets it populated at its peak. The first reason is that the business model didn’t work; and the second is that the science of the system worked a bit too well. You will get a very different impression if you read articles with titles such as “goodbye and good riddance.” But if you Google “NuVal” and read the more prominent disparagements of the system, you would readily find a theme if you looked. Identify the authors, or sources of derogatory comments- and Google them. Generally you will find they make and market highly processed junk food (which, of course, garners the low scores it deserves), or have ties to the beef industry- or they are personal trolls of mine. ...The main source of NuVal criticism is so-called “CPG,” or consumer packaged good companies- otherwise known as food manufacturers. Another is the “National Consumers League,” which sounds virtuous, but is actually a shell organization founded by those CPGs. This tactic is, apparently, standard operating procedure in propaganda wars. When the giants in the beverage industry wanted to oppose a soda tax in New York, for example, they created a new organization called “New Yorkers Against Unfair Taxes.” You had to dig to discover that soda companies were the exclusive sponsors and organizers. ...As for the science of NuVal, it has mostly failed because it works too well. The algorithm underlying the program was developed by a dozen diverse luminaries in nutrition- including past and current chairs of nutrition at the Harvard School of Public Health; the inventor of the glycemic index; the inventor of the volumetrics concept; and so on. I was privileged to lead the group, but every decision ran the gauntlet of consensus. The National Consumers League (NCL) has welcomed news that a supermarket-based nutritional scoring system of food products called NuVal, which at its peak was used in 1,600 grocery stores nationwide, has been discontinued. For the last five years, NCL has been a vocal critic of NuVal’s controversial ratings system. 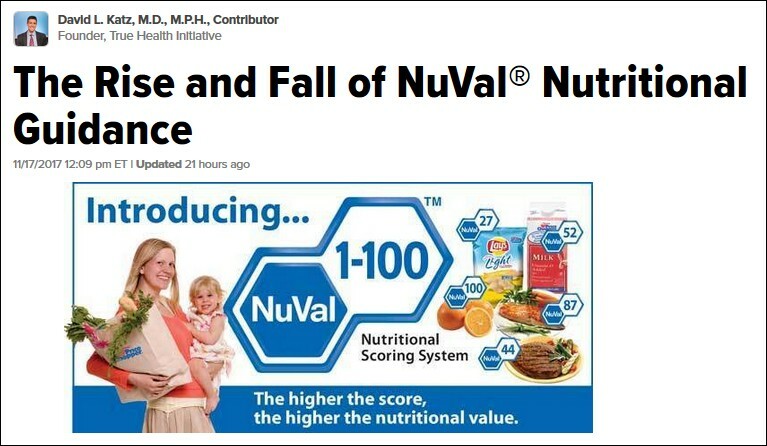 In a letter to the U.S. Food and Drug Administration (FDA) in 2012, NCL called NuVal “fatally flawed,” pointed out that it gave some junk foods higher nutritional ratings than canned fruit, and called for its investigation and removal from grocery stores. The consumer group criticized NuVal’s nutritional ratings as confusing - not helpful - to consumers trying to make healthy decisions for their families and called on the FDA to step in and set industry-wide standards to govern such systems so that they truly benefit nutrition-minded consumers. Other critics questioned conflicts of interest behind NuVal’s research and food manufacturers. NuVal - which at its peak featured in 1600+ stores in 31 states including Tops Friendly (Markets) in New York, Raley's in California and Big Y in Massachusetts, factored in positive nutritional attributes as well as negative ones, with nutrients with generally favorable effects on health (eg. vitamins) increasing the score, while nutrients with generally unfavorable effects (trans fat, excess sodium) decreasing the score. As with any system attempting to apply a standardized approach to thousands of foods across multiple categories, however, it threw up some strange results (read more here at USA Today and Yale Daily News), and attracted criticism from some big CPG brands and the National Consumers League (NCL) due to its refusal to publish the algorithms underpinning its scores. ...(What) do dieticians think of NuVal's demise? ...Andy Bellatti, Las Vegas-based RD, told FoodNavigator-USA that "Nutrition scoring systems can potentially help consumers, but there are some problematic issues at play, too." "First, each scoring system has its own formula (which is usually proprietary and kept hidden from consumers). If a formula is based on outdated or murky science (i.e. : any high-fat food, regardless of type of fat, is penalized), it isn't necessarily promoting the healthiest foods out there. "Second, many of these systems do not take into account ingredients. Nowadays, food manufacturers can use all sorts of nutritionally-empty or even potentially harmful ingredients to tweak values that appear on the Nutrition Facts label to make a product score well. "Third, this doesn't actually teach consumers anything. Once the scoring system is discontinued, or if a consumer goes to a store where the scoring system isn't used, they don't necessarily have the knowledge to determine what makes a healthful product. "At the end of the day, I just can't behind the idea that we need complex mathematical equations to determine that lentils are healthful and a high-sugar protein bar isn't a very healthful choice." Tops Markets is getting rid of a controversial nutrition ratings system it has used to help customers make food purchasing decisions. The system rates brownie mix and ice cream as healthier than some canned fruits and vegetables. ...Leonard H. Epstein, a distinguished professor and chief of behavioral medicine at the University at Buffalo medical school, served on NuVal's scientific advisory board. He said he didn't always agree with the creators' decisions, the system's creators didn't always take the board's advice and that, if he had been one of the system's makers, he "would have done things very differently." Consumers may find NuVal helpful if their diet is based on general USDA guidelines, Epstein said, but not if they prefer other diets, such as ones high in protein and low in carbohydrates, for example. ..."If you don’t believe in the criteria that NuVal uses, then the algorithm would not work to guide you to healthier eating," he said. In order to be useful, algorithms have to change to reflect changing science, he said. A shift in emphasis from fat to added sugar in the diet is one example. Tops said its decision to drop the NuVal system wasn't based on criticism or controversy surrounding NuVal but on customer feedback. As part of an annual evaluation to make sure its programs are relevant, it found there was no increase in customer participation with the program, so the company made the "hard decision" to bring the program to an end. West Sacramento-based Raley’s is phasing out a nationally utilized nutrition scoring system by the end of the year and is developing its own program to replace it in 2017. ...Raley’s spokeswoman Chelsea Minor said some customers have found it confusing. Coborn's, Inc. has introduced a new nutrition rating program which identifies for customers more than 5,500 products that "support their overall health." ...Endorsed by CentraCare Health, the in-house program replaces the NuVal Nutritional Scoring System, which was recently discontinued nationwide. ..."So what Nuval did was they looked at the overall nutrition and they gave it a score based on that," Kibutha said. "They scored everything. So even if something wasn't healthy, they still gave it a score, whereas we're just putting dietitian-approved on just the items we would endorse for the general public." ..."We have a lot of integrity behind this. It's science-based, 100 percent." According to (David) Katz, his new company DQPN* is entirely unrelated to NuVal or nutrient profiling. “DQPN is not at all prone to any kind of conflict, since it is not a scoring system of any kind,” Katz said. However, four members of DQPN’s team have also worked on NuVal: Harvard professors Walter Willett and Frank Hu, University of Toronto professor David Jenkins and California State University, Long Beach professor Gail Frank. At a lecture given at Jacksonville University on Oct. 25, Katz stated that the company plans to release an app called DIET ID that reinvents dietary intake assessment by identifying individuals’ dietary patterns and quality. Four of NuVal’s developers, including three who are now involved with DQPN, did not respond to multiple requests for comment. This item has been appended with the Yale Daily News report.